Traupman's text enables students to engage in one of the most productive practices in the acquisition of language skills—conversing. 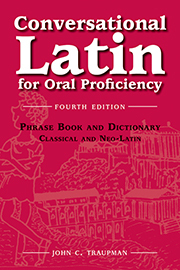 Latin is the language that gave birth to the modern romance languages; it can and should be spoken to enhance the learning experience. Appendices on "Yes and No in Latin," "Colors and Numbers," and "Sayings and Proverbs"